Contact Guardian Bears Kennel in North Carolina to learn about our Black Russian Terrier (BRT) puppies and breeding program. We're here to answer any questions you have about available puppies, our planned litters, BRT health, characteristics, temperament and much more. 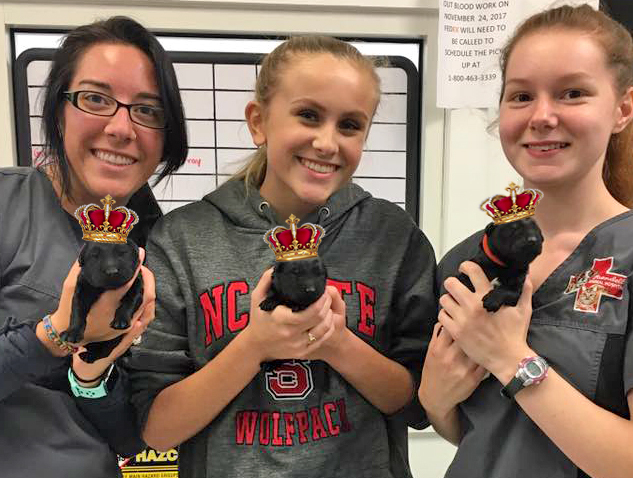 Introducing Our Royal E Litter from Princess Arisha! Guardian Bears Kennel is proud to present our much-anticipated Royal E Litter from Princess Arisha and Oli Tamale - the first litter from two of our Grand Champion Black Russian Terriers! On November 6, 2017, Princess Arisha gave birth to three massive baby boys, each weighing around two pounds! They are stunningly beautiful and we are looking forward to long, healthy lives full of love for these very special Guardian Bears. Contact us if you'd like to know more about these Royal Princes from Arisha and Oli! Click for More Photos and Videos! Located in North Carolina, USA, Guardian Bears Kennel breeds champion, thoroughly health-tested Black Russian Terriers (BRT). Owners DeAnne Hawkes and Richard Hawkes, DVM, are committed to preserving the BRT standard, improving breed health, and providing lifetime support and breed-specific guidance to buyers of their Black Russian Terrier puppies. If you'd like to submit an application to bring home one of our Black Russian Terrier puppies, you can download the application and send it to us via email or regular mail - or submit your application directly through our website.